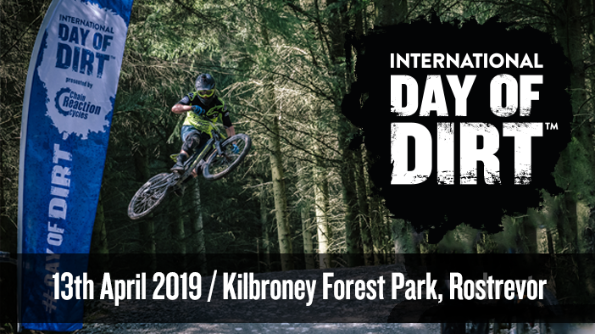 International Day of Dirt is Coming to Rostrevor! This is one of the biggest events in the MTB calendar as riders from all over the world ride their local trails and celebrate everything great about mountain biking. Hosted by Chain Reaction Cycles, there are 3 major events taking place globally, in addition to everything happening at riders' local trails. This year's special events are taking place at Rostrevor MTB Trails, at Sea Otter Classic in America and in Kalamunda MTB Park in Australia. In addition to the buzz of so many people out riding, Rostrevor will have bikes available for demo from Vitus, Nukeproof and Cube. There'll also be plenty of CRC / Mavic Team riders around. Whichever trails you'll be riding, you'll also have the chance to win a Nukeproof Mega bike worth £2,599 - just upload your pictures from the day with #DayOfDirt and #ChainReactionCycles. Not bad! So give the squad a shout and get ready to roll out on Saturday 13th April and enjoy your local trails. I seen this but I’m not 100% what it’s about/involves...is it just a day to ride bikes in rostrevor? Anyone heading up? Thinking I might. I think I might head up there! Anyone know how many people are expected to be there?